Make sure the gun is unloaded and all ammunition is put away! All parts should be installed by a certified Glock armorer. Making sure the firearm is not loaded! After checking to make sure the pistol isn't loaded, point the firearm in a safe direction. Firmly grasp and hold the gun as shown in Figure 2, and pull back on the slide about 1/8". Note: Do not pull back too far on the slide or you will reset the trigger, in which case you will have to pull the trigger again. 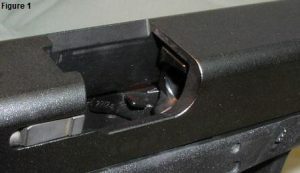 While holding the slide back as in Figure 3, pull down on both sides of the slide lock. You can then push the slide forward and remove it from the frame. Note: All parts in the instructions are stock and not Vanek Custom parts.